If there is one thing you can rely upon from a book by Tom Bale it is that from the very beginning it is going to take you on one heck of a journey as he takes an ordinary person and pits them against an extraordinary for. Each Little Lie is no exception to the rule as Jen Cornish finds herself battling against extraordinary odds and an unknown antagonist who is determined to see her go down for a crime she did not commit. Now if there is one thing Jen is guilty of then it is complete stupidity and naivety. At the very start of the book she makes what will turn out to be a very costly error in judgement, one which had me shaking my head in disbelief. Despite her lapse, Jen was a character I could totally get behind; a single mother trying to do the very best by her son and making all manner of sacrifices in order to ensure that he is happy. She is a strong and determined young woman and, despite the evidence to the contrary, actually much more intelligent than she is perhaps given credit for. When she decides to investigate on her own in order to prove her innocence she goes all out, and when it comes to protecting her son she will fight to the death. I really did kind of like her. Quite how she ended up with her drip of an ex-husband is beyond me as they don’t seem remotely compatible. When the chips are down he does try and stick up for Jen but he is very much more obsessed with his music and his money, the latter of which is supported by his father. Now he is an awful character. It is not hard to take an instant dislike to him – a man who uses wealth and fame, or rather notoriety, in order to get everything he wants and there wasn’t a single redeeming quality about him. Tom Bale really does excel when it comes to creating these snake in the grass kinds of characters. He also always manages to give the reader the thrill of the chase, in this case as Jen and her useless ex fly across the country in order to try and save their son. The stakes in this particular quest have been well and truly raised as not only has Charlie been kidnapped, but they are being followed by a man renowned for having no mercy and no guilt when it comes to the casualties of war. While the pace in the first half of the book is perhaps more pedestrian, or rather less frenetic, than in some previous novels, it certainly ratchets up several notches in the final section as we wait to see just who, if anyone, will make it out alive. Don’t let the pacing fool you though. The tension is right there from the start as we watch and wait to see, with the evidence stacked heavily against her, if Jen will be able to clear her name. I do love Tom Bale’s novels. Each time there is just something in there set to shock you and catch you unawares and Each Little Lie does just that. For example, Russell, the man who offers to help Jen get off from the charges against her. Just… yuk. No… Urgh. I am repulsed just thinking about him. His actions aren’t quite in the league of the lasagne scene in See How They Run but he will still make the skin crawl. There are just no words. There really aren’t. 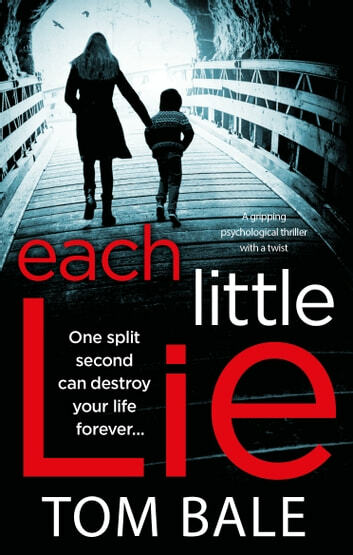 As I said before, Each Little Lie is a marked change in pace from the previous two novels by Tom Bale so if you are looking for that fast paced, dark edged, high action drama then this might not be for you. If you are looking for a character and plot driven story with a wonderful blend of characters, mystery and intrigue with a healthy side order of threat and menace then absolutely give this book a whirl. I loved it. Not a bad read however the plot had so many twists and turns I found myself confused on a few occasions. A good story topical of today where the plot evolves over custody of a child. You really start to feel sorry for the mother and the evil plots her ex father in law conjures up.